Your recipient will receive a certificate announcing their Cheesecake of the Month Club membership. Desserts ship the second week of each month. Desserts are perishable and are shipped frozen, packaged with dry ice in a heavy-duty Styrofoam container so each arrives picture perfect. Shipping cost is $106.80. 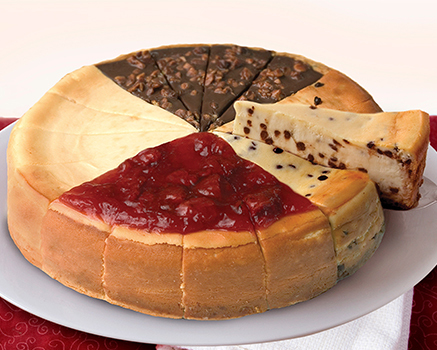 Thaw Eli's Cheesecakes overnight in the refrigerator or at room temperature for up to 2 hours. Once thawed, store in the refrigerator for up to 5 days. To serve, remove thawed dessert from box and remove shrink wrap and collar, if applicable. Remove the papers from each slice before serving. Frozen: Elis Cheesecakes can be stored frozen at zero degrees (0F) for up to 9 months, tightly wrapped.Refrigerated: Once thawed, Elis Cheesecakes can be stored covered up to 5 days in the refrigerator.